In the updated version of the service on the website, we have added a number of new features. Now you can group the securities, get your WatchList as of any archived date from the range of up to the year, as well as set up alerts for price or yield changes. For the sake of user convenience, all issues from the list can now be grouped together. To add issues to the group, check the required issues and click "Add" - "Issues to the Group." Within the framework of the functions, it is possible to obtain data as of archived dates within the last calendar year. In the current release, it is impossible to view ratings, offers, rates/coupon amounts, and price/yield changes. All the quotations are only displayed as of the given date. Now the service also provides the opportunity to set price or yield alerts based on issues from WatchList. When the limitation is executed, notifications are displayed on the service page, and an email message is sent to the corresponding email address. In the issue table, we have added a new parameter showing a change in the indicative price. Go to WatchList Service - http://cbonds.ru/watchlist/. Using Watchlist Service, you can track the latest information on your bond and international bond list. You can review instrument quotes of the chosen trading floors, issue parameters, calculated rates (yields and their changes, duration, ACI, etc.) in the convenient format. You can also download the data in xls and csv formats. 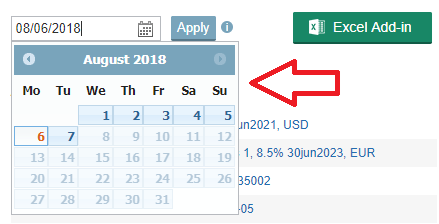 You can update your Watchlist in Excel Add-in (see more - http://cbonds.com/addin/) monitor it over using mobile application.